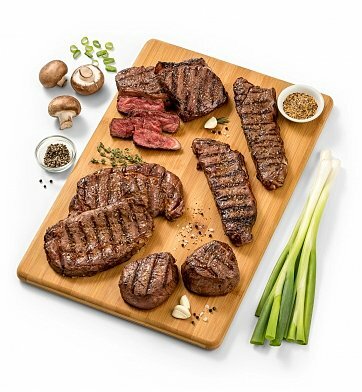 Tender filet mignon, succulent boneless strips, mouthwatering ribeyes and top sirloins full of flavor - this perfect combination of Premium Angus beef steaks is a best seller for Chicago Steak Company. Two (2) Filet Mignons, 6 oz. each. Two (2) Boneless Strips, 10 oz. each. Two (2) Sirloin Steaks, 8 oz. each. Two (2) Ribeyes, 8 oz. each. For Maximum Freshness, Please Note: Steaks are flash frozen before shipping to lock in flavor and will arrive frozen or partially thawed. if ordered by 7:00 am EDT Wednesday April 24th. Premium Angus Steak Selection is a hand delivered gift. These gifts are delivered by one of our local design centers located throughout the United States and Canada. Same day delivery is available for most gifts when ordered before the cutoff time. The cutoff time for Premium Angus Steak Selection is 4 AM in the recipient's time zone.